With many years experience you can trust on SB Autobodies. We are a small friendly run business. We have over 15 years experience. The majority of our customers are through reputation and word of mouth. We employ highly qualified staff with many years experience in the trade. We cater for the everyday man in his car or van to a fleet of light commercial vehicles also Private Hire Cabs. We carry out repairs, inspections and insurance work for all makes and types of vehicle. Our commitment is 100% to our customers whether its a small dent or major collision. Body Shop and Paint Repair Work. Thousands of vehicles are damaged in traffic accidents every day. Although some of these vehicles are beyond repair, others can be made to look and drive like new. We at SB Autobodies specialise in all types of body repair and welding work including straightening bent chassis bodies, remove dents, and replace crumpled parts that cannot be fixed. They repair all types of vehicles including light commercial vehicles. 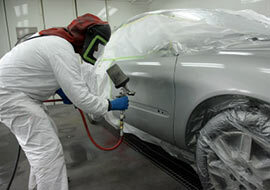 SB Autobodies use special equipment to restore damaged metal frames and body sections. 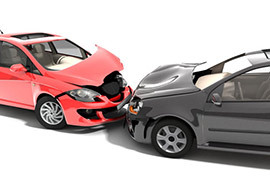 At SB Autobodies we even will take care of both your accident damage claim, personal injury claim and provide loan cars  let SB Autobodies take all the hassle away. Remove damaged panels and components by unbolting or cutting them away. Remove dents by hammering panels with panel beating tools such as a special hammer called a planishing hammer. Straighten badly damaged vehicles using mechanical and hydraulic equipment to obtain door, boot and bonnet clearances. Cut and join replacement sections or damaged panels using oxyacetylene and electric welding equipment. Fill dents with plastic fillers, and file, grind and sand repaired surfaces using power and hand tools. Fit the repaired panel on the framework of the vehicle and refit body hardware such as door locks and door trims. Replace badly damaged sections with new or second-hand panels. Realign chassis and body frames, and use chassis alignment machines and measuring systems. Remove and replace accident-related mechanical items. Assist in spray painting vehicles. Remove rough spots on vehicle panels and sand surfaces by hand or with electric/air sanders. Mix and match paint so that it is similar to the existing paint shade, or select pre-mixed paint. Operate equipment to clean, wash, strip, sand, remove corrosion, fill dents or otherwise prepare items for application of paint, lacquer or other protective or decorative coatings. Touch-up paintwork and apply polish to vehicles. Remove masking papers and wax and polish finished paintwork. Jig Alignment Facilities or Chassis Straightening, because modern vehicles are increasingly complex, an auto body repair shop must have the training, knowledge, skill, and state-of-the-art equipment needed for the precise, technical art of frame straightening. Our auto body repair shop features the technicians and the equipment necessary for safe, effective frame straightening with our Jig services.A jig and measuring system will straighten heavy impact damage to your vehicle structure by reversing the forces of the collision. With up to 10 tons of pulling power the strongest chassis members can be realigned. Using the measuring beams and gantry your vehicle can be returned accurately to the manufacturers specification. 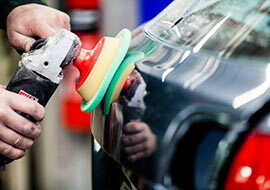 SB Autobodies don't just carry out major accident repair work. We do hundreds of small repairs every year, many carried out in a single day, using our fantastic dent removal and smart repair facilities in our workshop. At our workshop, we can repair the following damage, usually on the same day you drop your car off, at incredibly competitive prices: Bumper scuffs, cracks and scrapes.